Failure to recognize a normal variant. Perceptual errors occur when an abnormality is not identified. These errors obviously compromise patient care, and the courts occasionally treat perceptual errors as negligence. Sometimes perceptual errors result from external factors such as apoor viewing environment due to monitor glare, noise and distractions. Another cause is radiologist fatigue. They can also occur because the interpreting radiologist simply does not evaluate a specific image or anatomic location in a systematic review of the study. Perceptual errors may also result from technical factors. 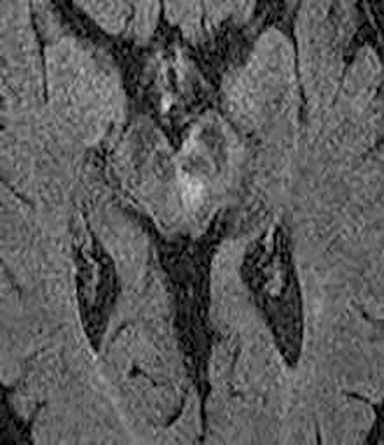 Technical factors include imaging artifacts, which may obscure the pathology due to image distortion. On CT studies, beam hardening artifact can compromise imaging evaluation of the posterior fossa structures including the brain stem. 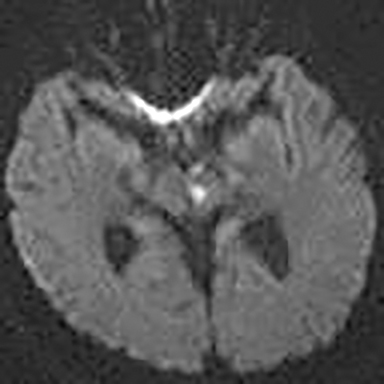 On MR, susceptibility artifact may obscure an abnormality. Another potential pitfall on MR is that the pulse sequence is not optimal for the detection of the pathology because different pulse sequences may provide different levels of conspicuity of pathology. 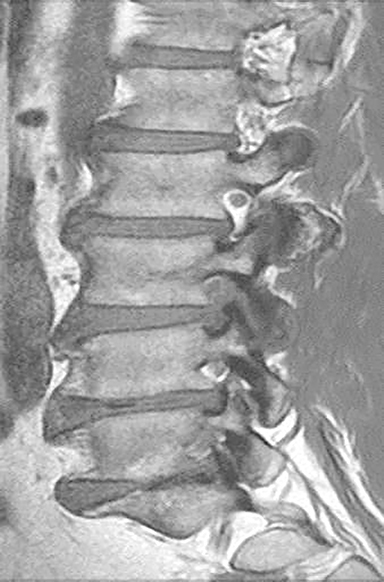 For example, on a T2-weighted image, a high signal intensity disc herniation may be difficult to see adjacent to high signal intensity CSF. It may be better appreciated on a T1-weighted sequence versus T2-weighted images (Figure 1) or images acquired using different techniques (eg. gradient echo versus fast spin echo). Another example is the lack of contrast resolution provided by a high resolution steady-state free precession/balanced gradient echo sequence. This sequence is ideal for distinguishing CSF from adjacent neural structures and brain parenchyma. The cisternal segments of the cranial nerves are, for example, extremely well depicted, essentially providing a high resolution cisternogram. It does not, however, display enough contrast resolution for the accurate detection of lesions within the brain stem (Figure 2). 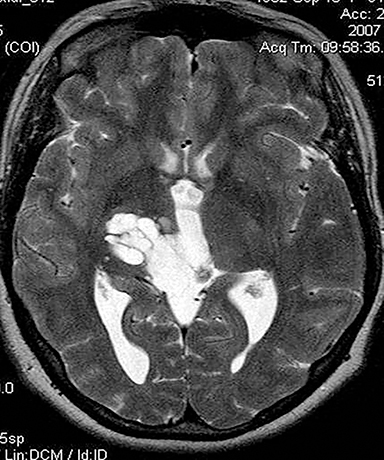 Inappropriate window and level settings on CT can also result in failure to perceive an abnormality. Because the eye can only differentiate approximately 32 shades of grey, the CT density range contains much more information than can be visually perceived.5 Avoiding windows that are too narrow or too wide for evaluation of specific pathology is essential. For example, bone windows are optimal for reviewing the paranasal sinus anatomy. However, there are both intra- and extra-cranial structures within the field of view that should be reviewed on any sinus study with soft tissue windows (Figure 3). Another potential cause of error is failure to complete a systematic search after discovering an abnormality (“satisfaction of search”). An obvious finding that draws the immediate attention of the reader may drive the interpretation, leading to an incomplete systematic interrogation of the entire exam. It has been shown that the accuracy of detecting lesions is significantly reduced for cases which have other abnormalities. This is especially common with polytrauma patients6 and those with syndromic abnormalities such as neurofibromatosis. Pathology outside the region of interest represents a similar cause for diagnostic errors. If attention is focused only on the anatomy being evaluated and adjacent structures are ignored, it is not difficult to miss potentially important findings (Figure 4). A corollary of failing to detect lesions outside the region of interest is failing to review the scout images. 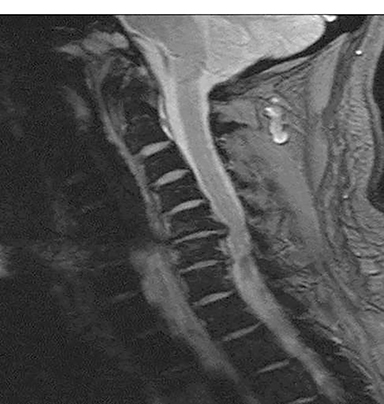 Interestingly, there are no specific statements in the ACR practice guidelines or other documents that require or even refer to the routine evaluation and interpretation of scout views obtained on CT studies.7 This is interesting in light of the review by Sener which demonstrated that 20% of abnormalities evident on 200 CT studies of the head and spine were identified only on the scout images.8 Another review by Johnson et al noted that a significant percentage of radiologists failed to examine the scout images.9 They reviewed 2032 scout views retrospectively. Major findings were found in 257 cases, and 48 major findings were not included in the field of view on CT. It is thus critical to review the scout views to exclude pathology that may be more difficult or impossible to see in cross section, or abnormalities outside the field of view of the cross sectional images. 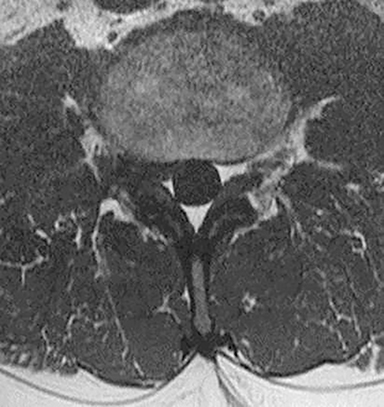 If the pathology is only visualized on the scout images, there is a 100% chance it will be missed by the radiologist who does not review scout images. 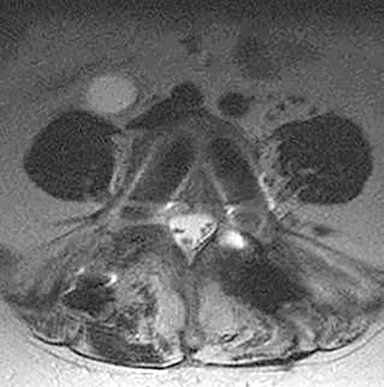 Another source of perceptual errors has been referred to as “anatomic blind spots” which may harbor abnormalities that are difficult to detect on imaging studies.10 These blind spots include cerebral sulci, dural sinuses, orbits, cavernous sinuses, clivus, Meckel’s cave, the brain stem, skull base and parapharyngeal soft tissues. These are regions where there may be densely compact anatomy with juxtaposition of vascular neural, bony, and soft tissue structures, making it difficult to assess pathology, especially in the absence of obvious mass effect. 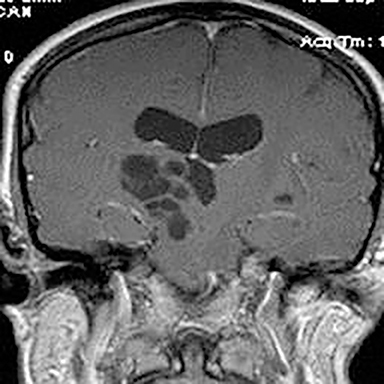 Infiltrative pathology such as lymphoma, small en plaque extension of meningioma and other neoplastic and infectious process may present a challenge in this regard. 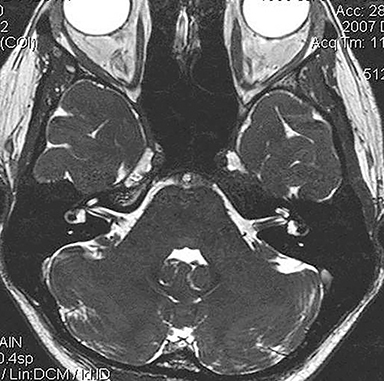 Some of these areas such as the orbits and cavernous sinus are poorly evaluated without intravenous contrast and a small field of view acquisition (Figure 5). Extracranial structures are another area that should be carefully evaluated. The head and neck spaces formed by the three layers of the deep cervical fascia include the pharyngeal space, carotid space, masticator space, retropharyngeal space and prevertebral space. 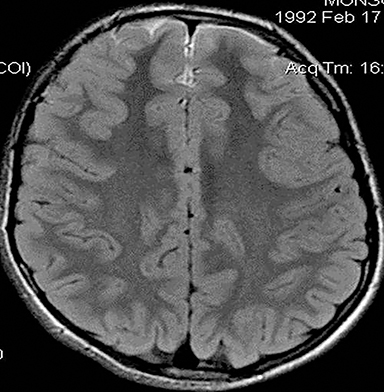 The extracranial compartment anatomy is frequently overlooked on brain imaging studies, resulting in missed pathology due to failure to evaluate these areas (Figure 6). 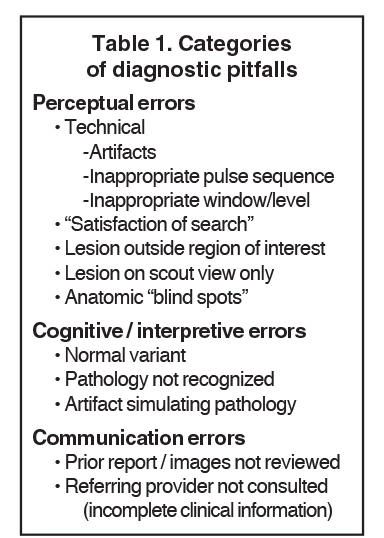 Interpretive/cognitive errors occur when a radiologist identifies an abnormality or a normal variant, but fails to recognize and properly identify it. Interpretive errors may be caused by imaging artifacts, normal variants that are not recognized, or misinterpretation of a pathologic finding because the interpreter is not familiar with it. For example, one could misinterpret a normal premature infant brain as lissencephaly because the post-conception age of the child is not known. 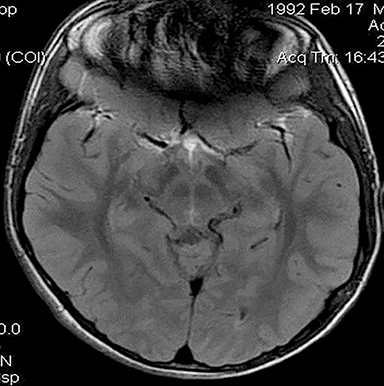 The normal prominence of the sulci and subarachnoid spaces in 18- to 24-month-old children could be misdiagnosed as an extra axial fluid collection, when in fact physiologic external hydrocephalus in children is a normal finding.10 In addition to obscuring pathology resulting in false negative studies, imaging artifacts may mimic pathology resulting in false positives. Many of these artifacts are avoidable or minimized through modification or selection of the proper pulse sequence. Recognition of artifacts is thus essential, making it useful to have a basic understanding of MR physics in order to recognize and correct them on imaging studies (Figure 7). A number of normal variants may appear to represent pathology to the uninitiated. For example, the signal void caused by a pneumatized anterior clinoid process may mimic an internal carotid artery aneurysm due to juxtaposition with the supraclinoid internal carotid artery. Conversely, an aneurysm in the right location may simulate a normal variant pneumatized anterior clinoid process. 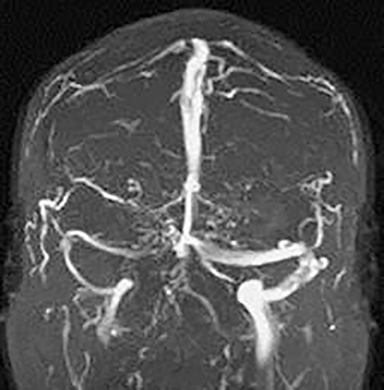 Another example is tumefactive perivascular spaces, which may have a striking appearance (Figure 8). The appearance of a multiloculated cystic lesion may cause concern to the reader who is not aware of this harmless variant. Large perivascular spaces may occur in the brain stem, in the vicinity of the basal ganglia and in the subcortical parenchyma. 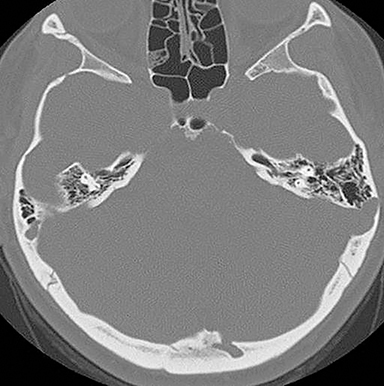 Large arachnoid granulations are another potential pitfall, as they cause defects in the dural sinuses on digital or MR venograms. 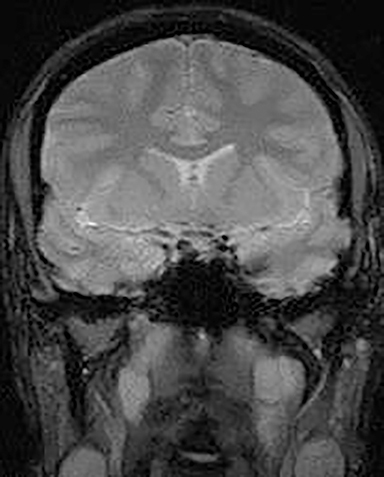 Their morphology distinguished them from thrombus, which doesn’t result in a focal or globular defect but rather segmental absence of flow within the affected dural sinus. Anatomic variants may also occur in the skull base. For example, a midline well marginated osseous defect within the clivus filled with lymphoid tissue has been described as a fossa navicularis magna. 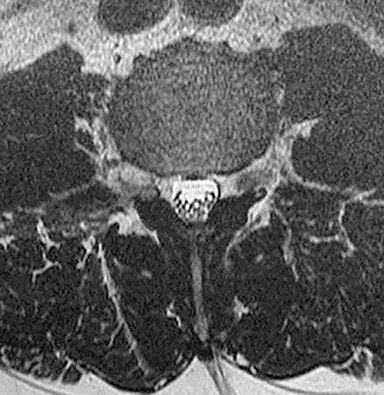 This variant can be dismissed as a harmless variant as long as the posterior clivus is intact (Figure 9). Information from previous studies, the referring physician or the patient may provide critical input that improves diagnostic accuracy and helps avoid significant diagnostic errors. White et al found that prior information (report or images) increased confidence of the interpretation in 89% of cases reviewed, influenced the diagnosis in 56% and assisted in detecting new pathology in 6% of interpretations.12 A review by Hunter et al found that the prior report was useful 63% of the time and saved the interpreter from an embarrassing error in up to 12% of the time. In 14% of cases, it resulted in a significant change in the patient’s diagnosis and 34% of the time it resulted in preserved consistency of departmental reports.13 As EMR access continues to improve, so will our access to prior studies and reports when reviewing diagnostic exams. In addition to reviewing prior reports or imaging studies, it is usually helpful to consult with the ordering physician regarding clinical information (which is frequently incomplete on the exam orders). A short discussion with the referring provider can provide critical information that can focus your image interrogation and allow you to make more pertinent comments in your report. Finally, communication of significant or unexpected abnormalities to the primary physician is another important component of imaging services. Specific strategies to avoid diagnostic pitfalls address the root causes of perceptual, interpretive and communication errors. Some radi ologists prefer using checklists to ensure that specific structures are reviewed.14 When evaluating sinus CT exams for example, we use a formatted or structured report that includes fields for the scout radiograph, structures outside the sinonasal cavity, each of the sinus chambers individually, and finally the nasal cavity. Additional strategies that can be implemented to minimize or avoid the diagnostic errors discussed above are summarized in Table 2. These include a patient information form that indicates whether prior imaging studies have been performed. At check-in, your staff should obtain authorization for release and transfer of imaging studies from an outside institution if prior studies exist. The radiologist should be made aware of the existence of such studies. Departments should also establish a peer review program in which a percentage of studies are evaluated by colleagues to provide feedback regarding any diagnostic errors. Another way to leverage the experience of colleagues is to consult with them liberally when a challenging case is encountered. We work in several centers in our market, but can electronically transfer cases to each other to accomplish this. 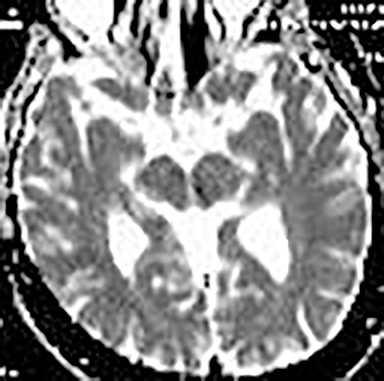 We also have a low threshold to consult the medical literature via the internet to review all the potential imaging manifestations of a given disease or to explore other entities when generating a differential diagnosis based on clinical signs, symptoms and imaging findings (rely on peer-reviewed references only). Additional clinical information regarding a specific patient can also be obtained by contacting the referring physician. Data obtained from these conversations often influences the final report and helps to avoid interpretive errors. Another important method for avoiding diagnostic pitfalls is using a systematic search or structured image evaluation for interrogating imaging studies so that areas such as the extracranial structures and anatomic “blind spots” are not ignored. This is especially important when an obvious abnormality is identified upon initial review of an imaging study. Don’t succumb to “satisfaction of search,” which may curtail a thorough review of the imaging study. To recognize and avoid imaging artifacts, and to explain various signal abnormalities on an imaging study, an understanding of MR and CT physics is important. 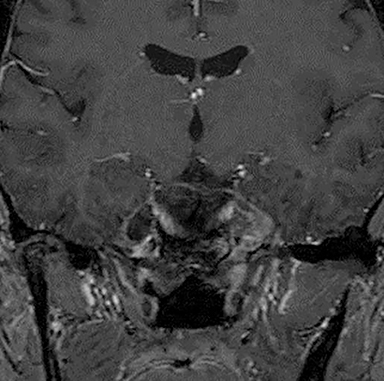 It doesn’t have to be at a PhD level, but a working knowledge helps avoid pitfalls due to artifacts and to optimize imaging technique for the visualization of pathologic findings. It is also important to use appropriate and variable grey scale settings when evaluating CT studies so images have appropriate contrast resolution. Human factors such as excessive workload and fatigue should obviously be avoided as well. The working environment should be optimized with respect to ergonomics and avoidance of distractions and glare affecting the monitor or imaging surface. Finally, it is important that the radiologist be familiar with anatomic blind spots, normal anatomic variants and other causes of diagnostic pitfalls summarized in this article in order to recognize and avoid the common causes of misinterpretation of imaging studies. In the future, artificial neural networks may reduce perceptual and interpretive errors through computer analysis of images augmented by an artificial intelligence. To date, computer assisted diagnosis has not developed to a point that it will replace the radiologist’s eye and interpretive skills, however. (As a side note: If we do not ensure that our roles have evolved beyond image interpreters by the time it is available, radiology’s future as a specialty is bleak). In the short term, employing strategies to avoid diagnostic pitfalls leads to improved patient care and clinical outcomes, as well as a decreased chance that we find ourselves in a courtroom. Long term, we must continue to expand our role as patient caretakers, data managers and as integral members of multispecialty teams to secure the future of our specialty. Renfrew DL, Franken EA, Berbaum, KS, et al. 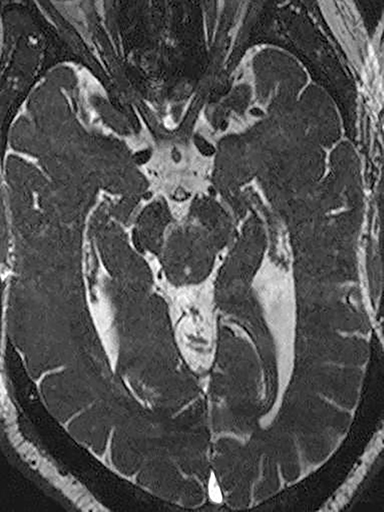 Error in radiology: classification and lessons in 182 cases presented at a problem case conference. Radiology. 1992;183(1):145-150. Berlin L. Accuracy of diagnostic procedures: Has it improved over the past five decades? AJR Am J Roentgenol. 2007;188(5):1173-1178. Robinson PJ. Radiology’s Achilles’ heel: error and variation in the interpretation of the Roentgen image. Br J Radiol. 1997;70(839):1085-1098. Gomeri JM, Steiner I. Non-Linear CT Windows. Computerized Radiol. 1987;11(1):21-27. Berbaum KS, El-Khoury GY, Franken EA, et al. Missed fractures resulting from satisfaction of search effect. Emer Radiol. 1994;1:242-249. Berlin L. Reviewing the CT scout view: medicolegal and ethical considerations. AJR Am J Roentgenol. 2014;202(6):1264–1266. Sener RN, Ripeckyj GT, Otto PM, et al. Recognition of abnormalities on computed scout images in CT examinations of the head and spine. Neuroradiology. 1993;35(3):229–231. Johnson PT, Scott WW, Gayler BW, et al. The CT scout view: does it need to be routinely reviewed as part of the CT interpretation? AJR Am J Roentgenol. 2014;202(6):1256-1263. Bahrami S, Yim CM. Quality initiatives: Blind spots at braining imaging. RadioGraphics. 2009;29(7):1877-1896. Otto KJ, Hudgins PA, Abdelkafy W, Mattox DE. Sigmoid sinus diverticulum: a new surgical approach to the correction of pulsatile tinnitus. Otol Neurotol. 2007; 28(1):48-53. White K, Berbaum K, Smith WL. The role of previous radiographs and reports in the interpretation of current radiographs. Invest Radiol. 1994;29(3):263-265. Hunter TB, Boyle RR. The value of reading the previous radiology report. AJR Am J Roentgenol. 1988;150(3):697-698. 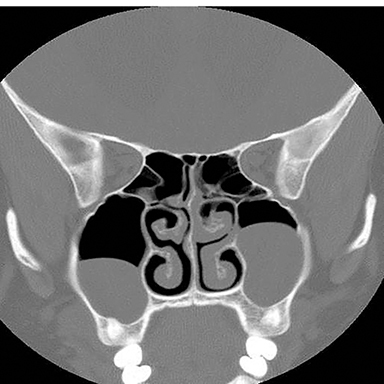 Martinez Del Pero M, Philpott C. A useful tool – systematic checklist for evaluating sinus scans. Clin Otolaryngol. 2012;37(1): 82-84.4. Johnson BA. 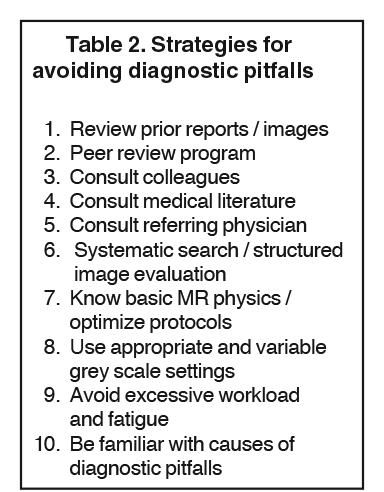 Avoiding diagnostic pitfalls in neuroimaging. Appl Radiol. 2016;45(3):24-29. Dr. Johnson is Medical Director at the Center for Diagnostic Imaging, Minneapolis, MN. He is also a member of the Editorial Board of Applied Radiology.